Wire ropes in suspension structures and Bridges are used as members to bare very heavy load. The integrity of wire ropes deteriorates with time owing to fatigue, corrosion and abrasion and they finally may break the ropes. As breakage of ropes, especially large diameter ropes, will cause a miserable disaster, preventing from such a disaster we must inspect wire ropes periodically by a proper NDT method evaluating the degree of deterioration. 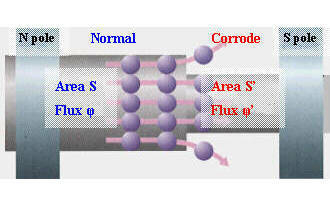 Flaws caused by fatigue are localized, and are detected easily by a conventional magnetic NDT method. On the other hand, corrosion and abrasion cause loss of metallic cross-sectional area which usually are not localized but spread, therefore they are difficult to be detected by the conventional method. So far corrosion and abrasion have been evaluated mainly by visual inspection. The authors have developed a new magnetic NDT method, which is a modification of Main Flux Method(MMFM). The system of the developed method consist of magnetizing units, sensor units and a personal computer, and can evaluate the loss and residue of metallic cross-sectional area of wire ropes quantitatively. As some of the wire ropes used for structures and bridges are getting old nowadays, we must make haste to inspect them by a proper NDT method to keep them safe. In this paper, the results of a series of experiment to certify the accuracy of MMFM are described. In the experiment a 330mm diameter rope which is bundle of 31 ropes of 52mm diameter and 6 ropes of 34.5mm diameter, whose total metallic cross-sectional area is approximately 55,123mm2. The most conventional inspection method for wire ropes is the visual inspection in which the experts observe the surface and assess the rope condition empirically. 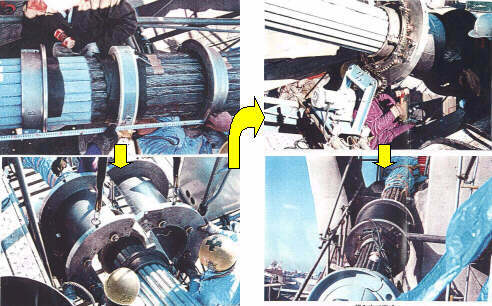 The experts of visual inspection for wire ropes have decreased and cannot evaluate the inner failure such as corrosion. So magnetic NDT has been developed to detect the failure in wire ropes. Magnetic Flux Leakage Method(MFL) can detect the localized failure such as the wire breakage and Main Flux Method(MFM) can evaluate the degree of corrosion and abrasion. But original MFM evaluates the only relative loss of metallic cross-sectional area of wire ropes. The authors have developed a new MFM to evaluate the residue of metallic cross-sectional area quantitatively. Wire ropes have magnetic properties because they are made with drawn steel wires. When a wire rope is longitudinally saturated by a strong magnetic field, the magnetic flux in the rope is well proportional to the rope's metallic cross-sectional area as shown in Figure 1. By original MFM using a constant magnetic field, only the relative change in area can be evaluated, but the absolute area cannot be evaluated because the magnetic histories of wire ropes affect the absolute values of magnetic flux. By the newly developed method, which is Modified Main Flux Method(MMFM), the absolute value of metallic area can be evaluated by measuring the magnetic loop and the parameter Df which is the change in magnetic flux under a very strong bi-polar magnetic field as shown in Figure 2. The measurement system of MMFM consists of magnetizing units, sensor units and computing units as shown in Figure 3. Magnetizing units include an electromagnet, a variable direct current (DC) power supply and a switch of polarity. Sensor units include the search coil, flux-meter, Hall-sensors and Gauss-meter. Computing unit is a personal computer and controls the magnetizing current, logs the measured data and assists the analysis. The measurement system can be combined at the measuring point in order to reduce the weight of magnetizing units as shown in Figure 4. To certify the accuracy of MMFM, the authors made a series of experiment, using the large diameter rope which is bundle of 31 ropes of 52mm diameter and 6 ropes of 34.5mm diameter. The total diameter is 330mm and the total metallic cross-sectional area is approximately 55,123mm2. Flux values in the rope with various inner and outer artificial faults, which have 0 through about 10% loss of metallic areas as shown in Figure 5, were measured by MMFM. Whichever the artificial faults arranged in the inner part or outer part, the evaluated metallic areas were precious with the error of about 1.0% as shown in Figure 6. Magnetic flux in a wire rope is affected by the magnetic field intensity and the stress in the ropes besides the metallic area. In the case of MMFM, as the magnetic field is strong enough and its range is constant, the effect of magnetic field intensity is already considered and involved in the measured parameter. While stress in the rope can be measured by another method such as the string vibration method, the effect of stress for the flux depends on the construction of wire ropes, and it is 0.8% through 1.6% per 200N/mm2(See figure 8). The degree of corrosion in over 30 wire ropes of aging atructures and bridges in Japan were evaluated by MMFM. The evaluation results are shown in Table 1 and 2. As corrosion has been affected by the using condition and environment, the loss of metallic area is often independent of the ages of wire ropes. It is necessary to conjecture the residual strength of the rope from the loss of metallic cross-sectional area measured by MMFM. According to the experimental results, the reduction of rope strength is much larger than the loss of metallic area and the degree of reduction depends on rope construction as shown in Figure 12. Spread loss of metallic area caused by corrosion and abrasion can be evaluated quantitatively. To evaluate more precisely, MMFM should be done periodically. There are Many wire ropes, which have been in use as the most important parts of structures and bridges for a long time, around the world. Perhaps some of them have deteriorated with time owing to corrosion. In order to keep such ropes safe and prevent from accidents, the ropes must be evaluated by proper NDT methods.